I participated in this program on behalf of The Fred Rogers Company and The Motherhood. All opinions are my own. I don’t think that I’m alone in the fact that I grew up watching Mr. Rogers Neighborhood. It was a show I stopped to watch no matter what I was doing, one that I would specifically request if it wasn’t already switched on. Fortunately with such great values and lessons being modeled, my parents were happy to oblige me. Sharing Mr. Rogers Neighborhood with my daughter is something I had hoped to do, and I was a little sad that I wouldn’t be able to do so. 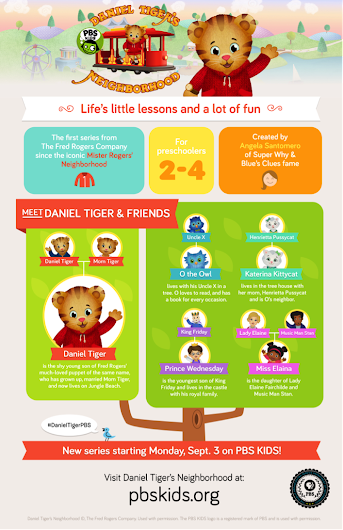 Then one day last fall I flipped over to PBS KIDS and saw something new: Daniel Tiger’s Neighborhood. It’s a new animated follow-up to the original Mr. Rogers Neighborhood and it instantly took me back to my childhood. Recently I had the opportunity to talk with some of the folks behind Daniel Tiger’s Neighborhood and the new line of Daniel Tiger toys. It was awesome to see the enthusiasm and passion that they had for the original and how well they were able to carry over the storyline. If you look at the side-by-side of Mr. Rogers and Daniel Tiger you can easily spot the similarities.